Download a free digital copy right now. Church welcome packets or gift bags can be a meaningful way to welcome visitors. However, the best church gift ideas are the ones that connect, truly help people, and are hard to forget. Whatever they may be, all gifts for church visitors should effectively thank and invest in them at the same time, whether they are believers or not. Newcomers to the church may only visit once; and for these first-time guests, a thoughtful gift can have a tremendous impact in fostering a deeper connection. Ultimately, all church visitor gift ideas should genuinely seek to draw people towards Jesus and the church community. 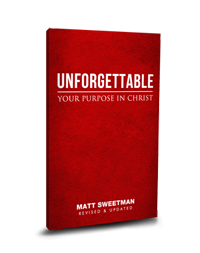 Pastor Matt Sweetman wrote Unforgettable with this purpose in mind. By giving this affordable book to church visitors as a "thank you for coming gift", guests will leave with one of the best chances to hear the message of Jesus, grasp a biblical vision for their life, and next steps to take. Download your free copy and see for yourself. Click here if the video won't play.